Treating sleep apnea is often accomplished through behavioral changes. Therapies and treatments can be expensive. One affordable solution is simply finding right pillow. If you find the best sleep apnea pillow, you can get into the right posture and pressure, which can really help. There are many gadgets and devices for treating sleep apnea. Mouth guards, tongue retaining devices, and breathing machines included. If you have this problem, you may find these items uncomfortable. Unless custom fit, they may not work at all. It may help to have a specialized pillow to go along with an anti-apnea device or that alleviates the symptoms on its own. Pillows are available for use with or without a CPAP machine. Continuous Positive Airway Pressure devices are common treatment options. Some apnea pillows are made to be used with them. A common style is the wedge shape. It elevates your upper body, prevents airway collapses, and makes you more comfortable when using the machine. If you don’t use the CPAP machine, there are pillows that help with positioning the neck to alleviate snoring and align your airways. Sleep apnea is when you stop breathing during sleep. The severity depends on the frequency this happens and what is causing it. An obstructed airway is a common trigger. There are several things to consider when choosing a pillow. These address the root causes of sleep apnea and include neck support, so your tongue does not block your airway. Additional support for the head relieves pressure on the arms and shoulders. The overall design lets you comfortably sleep on your side. For sleep apnea, sleeping on your back increases snoring. If you do sleep on your back, then a different kind of pillow will help correct the problem. Your position and alignment during sleep and the type of obstruction causing the apnea can indicate which pillow may be right for you. As much as you might want to use a ﻿traditional﻿ pillow, it does not provide enough support. 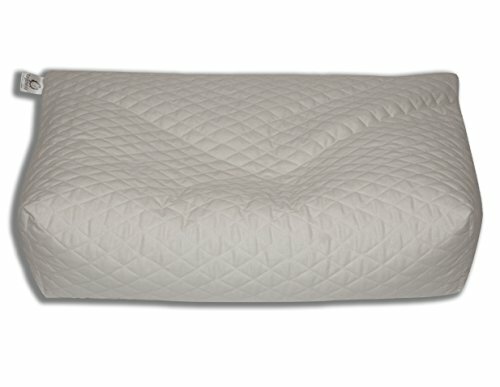 A traditional pillow also does not have the shape and cutouts to accommodate a CPAP mask if you wear one when sleeping. Some pillows relieve mild to moderate sleep apnea on their own. This can avoid a mask if you find it uncomfortable. In any instance, there are several types of such pillows. Here are a few common varieties you might find beneficial. Wedge pillows are better if you sleep on your back. Doing so increases the risk of airway obstruction. These pillows are made to support the back of your neck. A concaved shape supports the back of your head, so you have a better and more natural way to line up the neck and breathing passages. Side sleep pillows, on the other hand, let you sleep comfortably on your side. If you have sleep apnea, sleeping on your side is most often recommended. This positions you to best open the airways. The best choice is a medically approved item. Some pillows are designed to reduce pressure, distribute body weight, and increase blood flow. Other options are side and back pillows, which combine side and back support while aligning your spine and body. This keeps the airways open during sleep. In many cases, they work whether you sleep on your back or side. There are also specialty pillows to provide snoring relief and which accompany a CPAP mask. They reduce pressure on the device, minimize leaks, and limit discomfort. Some are designed for sleeping in any position you want. These pillows are the most non-invasive way to treat sleep apnea. You can often improve your health without an uncomfortable device or mask or even surgery. Also, you might even have less back and neck pain. The pillows are shaped to improve sleeping posture that is a strain and a cause for snoring. You might think the variety is limited, but sleep apnea pillows come in all sorts of styles. Different materials and shapes are also available. Pillows used with a CPAP mask are beneficial because you can sleep comfortably and change positions during the night. This becomes possible without breaking the seal or the mask falling off. Another benefit is you won’t have to keep adjusting the straps on the device. Those who use pillows for apnea usually sleep better for longer and feel better overall. It helps to reduce pressure so the mask won’t leave as many lines on your face in the morning. Perhaps the most significant perk is you’ll be alert and efficient all day. The drawbacks depend on the person using the pillow. The height or thickness is an issue for some. You might even feel like it’s too low. Everyone is different so your size, height, or sleep position may help decide what the best sleep apnea pillow may be. Some types of pillows are adjustable, letting you add or subtract materials to get the right height and thickness. Regardless, sleep apnea pillows require an adjustment period. Also, remember the condition is unique to your anatomy. There's a chance a pillow may not work at all. For some, it helps reduce snoring and many other apnea symptoms. The process of choosing, therefore, may be trial and error for some people. These are just some drawbacks, but such a pillow is worth trying if you suffer from sleep apnea. If you sleep better, snore less, and feel better during the day, the investment is worthwhile. The following reviews will help decide how to pick the best product for you. Adjust this pillow's thickness and shape, so you don't have to wake up breathless and irritated. This therapeutic pillow's natural buckwheat hulls and shredded foam can be added or taken out, making it softer or firmer to your heart’s content. Just open the zipper and give it a go. Whether you fancy sleeping on your side, back or stomach, quickly adjust the pillow for comforting support. A three-layer quilted shell doesn't hurt either. This pillow's antimicrobial and hypoallergenic properties keep you sniffle free and unburdened by any further airway obstruction. You'll also awaken free of pain or soreness as its careful design eliminates pressure points. Another perk is that the CPAP pillow is machine washable. If snoring or breathing troubles are affecting your sleep, this one's worth a try. Get a more comfortable sleep with this pillow and the most out of every breath of fresh air. You will sleep peacefully and wake up rejuvenated. The polyester-filled pillow is specially made, so there are no pressure points on your sleep apnea or BI-PAP mask. A unique 23 x 18-inch star shape makes it perfect for a peaceful sleep on your side or stomach. Better yet, it's a relatively inexpensive option in the world of C-PAP pillows. No matter how you look at this cool pillow, it offers comfort where you didn’t see it before. It also meets several safety compliance requirements. You would never know such strict guidelines were followed because it allows a night of comfortable sleep with or without a breathing mask. This pillow has the perfect anti-snore shape. You no longer have to awaken yourself or your partner at night. A ventilated visco-elastic memory foam makes it cool and pleasant. Your sleep experience is also enhanced by inner and outer fabric cushioning. The outer cover can be removed and cleaned, so you can feel fresh all night long. Feel rested and rejuvenated in the morning as a special contouring takes the pain of pressure points away. Dirt won't infiltrate the soft inner layers either. The knitted inner cover will block it, so you never have uncomfortable knots and knobs. The included zippered storage bag will let you take this pillow anywhere you go while ensuring it remains firm and plump for the next night's sleep. Here’s the perfect organic buckwheat hull pillow for a great cushion and snoring relief. It’s so cozy you can even meditate on this pillow. That’s what it was designed for, so there’s no lack of relaxation with this pillow’s head, neck, and shoulder support. You also get the adjustability of buckwheat hulls – not a bad thing at all! This multi-functional pillow offers the choice of sitting or sleeping on it. One thing's for sure; you'll breathe easier at night. At 22 inches across, this pillow gives you ample comfort room. You’ll get a better night’s sleep and also have the elevating support to relieve your sleep apnea. This one is different from the rest because you can use it in so many ways. Sachi Organics has figured out a way for you to get your money's worth. Regardless, the pillow will still keep its shape while the hulls and cotton conform to your position. This rings true no matter how your head or body are shaped. A three-layer quilted cotton shell, cool and breathable materials, and non-allergenic/anti-microbial material also contribute to night-long comfort. You can sleep peacefully all night long and even wake up feeling good. The carefully engineered shape keeps you free of pressure points so the aches and pains won’t test your patience in the morning. Also, this pillow will conveniently fit any standard-sized case. You’ll spend less time running around for one and more time sleeping comfortably. Just unpack it and put in the buckwheat filling, and you’re ready to go – to sleep. I hope the information in this article provides you with insight into what sleep apnea pillows and their benefits are. The product examples should help identify the features to look for so you can have a perfect night’s sleep. Finding the a great sleep apnea pillow can be a challenge. There are all sorts of shapes and sizes, materials, and brands. The difficulties arise because anyone with sleep apnea has a unique anatomy and possible cause.